Accurate forecasting is an essential part of business. Knowing what return you can expect for a given expenditure is essential in planning any marketing campaign, and SEO is no different. Forecasting the return of an SEO campaign is inherently difficult: there are a lot of factors out of your control, however that’s also the case in old media too. You might spend £350,000 on a prime time advertising slot, but have no real knowledge of how many people would switch off and miss your commercial. SEO Forecasting is no different to weather forecasting. It requires access to data, the ability to analyse it, and the experience to predict likely outcomes given previous knowledge of behaviour given a set of initial conditions. It’s also never going to be 100% accurate, but the more data you have, the better the model you can build, and the closer you can get to predicting what will happen given the circumstances. My first port of call is to investigate the current situation as much as possible. Review the client’s website in relation to competitors, identify the key terms that they want to rank for and pinpoint their current rankings in non-personalised search results (tip: add pws=0 into the search results URL). The Google Adwords keyword tool is comprehensive enough to give you a starting point finding search volumes, and although the figures are sometimes pretty far off, it’s going to give you some insight into what’s out there in the market. It’s important to use a combination of exact match short tail keywords to get a feel for the key volume generators, and also take into account the ratio of exact match:broad match volumes to get a feel for the wider market. Google’s keyword tool only provides you with an estimated search volume for last month, so I then use Google Insights to get some seasonality data. GI provides you this on a weekly basis over a period of years. 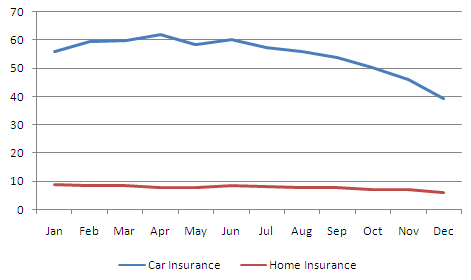 By averaging out this data for a number of keywords on a month to month basis and normalising it across the full history, you are able to get a fairly good idea of month to month seasonality for your industry. If you’re working with a partner that has multiple seasonal demand curves across different product sets, you should break out the keywords into individual groups to better reflect what you’re going to see in terms of overall search demand. 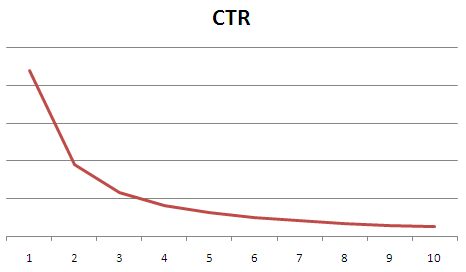 It’s important to think about the long tail in addition to the prinicpal target keywords for a campaign. Google Keyword Tool lets you estimate the size of the market beyond your key terms. A niche site is going to have a short long tail (:-)) while a larger site is going to have a much bigger range of ancillary keywords to target. As well as the long tail, you also want to take into account the influence that additional search traffic will have on brand volume. With a new:returning ratio, you can estimate the halo effect that your generic search traffic will have on brand. This is important. There are various sources of information you can use for your click through model. The AOL data from a few years ago is one place, although behaviours have changed a bit since then. There are plenty of different models including this one from Optify that you can use to estimate how much traffic you get from a particular position. I’ve removed the vertical scale because this tends to be variable. The starting CTR at position 1 for a specific term is generally higher than for a generic term, and even higher for a brand term specific to the website that’s ranking. Optify average the position 1 CTR at about 36%, Red Cardinal looked at 42% or so. I’ve seen other models that were as low as 20%. They’re probably all right for their data set. Here, the damping factor is the CTR from position 1. 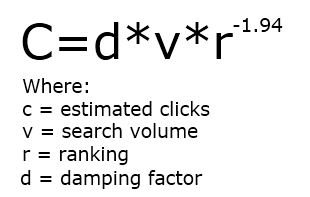 In most cases, you’d want to vary the damping factor for the CTR depending on the type of keyword. A more generic term is likely to have a lower CTR – maybe around 20% as not everyone searching on that keyword will find what they’re looking for and will need to refine. The more specific the term, the more likely you are to get a result. Another thing to consider over time is whether you expect changes you make to the Meta Description and title to elicit a higher CTR from the SERPs. If you are active in that area, you might want to reflect this in an increasing damping factor over the course of the campaign – lets say for a generic keyword you start off with d=0.2 in the equation above, after 6 months you might have pushed a better creative message out through user testing and move to a d=0.25 to reflect your optimisation. The next step from estimated traffic is estimated conversions. At first SEO is all about incremental business. About growing visibility to get growth. Then it’s about maintaining that piece of the pie. 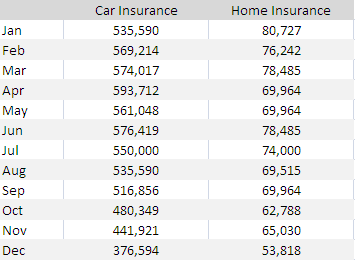 Sales are pretty easy to predict if you have historic conversion rate data. As with the search volume seasonality, your client’s website may have seasonal conversion changes, so you need to factor those into the calculations. Also, conversion is not even across keywords – depending on the complexity of the site you may see different rates across different keyword groups, and certainly across brand and non brand terms as I discussed here. From sales, you can also calculate revenue provided you have historic average order value. As with everything else, the more data you have, the more accurately you can predict. Splitting AOV across product types and seasonality you can get a pretty good picture of the return of the campaign over time. Your performance forecast needs to be more than just a sales tool to impress a prospect and win the business. You might forget it once the contract is signed, but your client won’t. They’ll refer back to it in meetings and compare your progress with the forecast over the course of the year. Of course things will change over time. It’s rare that a campaign you start in January has anything like the same objectives come June, and because of this it’s important to refine what you expect to be doing regularly. There’s another advantage of reviewing forecasts. The more rigorously you challenge your own data, the more you can refine your campaign forecasting ability. When you put together the initial forecast you might have expected it to take 3 months to hit a specific KPI which in fact actually took 6. Use this information next time you build a forecast. It will stop you looking dumb and having to back track on objectives further down the line. If you’re providing a forecast over time, your experience is the most important tool you have. Based on the competitiveness of an industry and the level of activity being taken by competitors, you should know roughly how long you would expect it to take to get a site to a level where it could grab a first page ranking, and then how long it would take to get higher up the rankings. This is important. A client may be committing a sizable chunk of their marketing budget to the campaign based on your forecast. If you are wildly optimistic or unrealistic because you think it will help you win business, then you could be putting a someone else’s business at risk. That’s not cool.